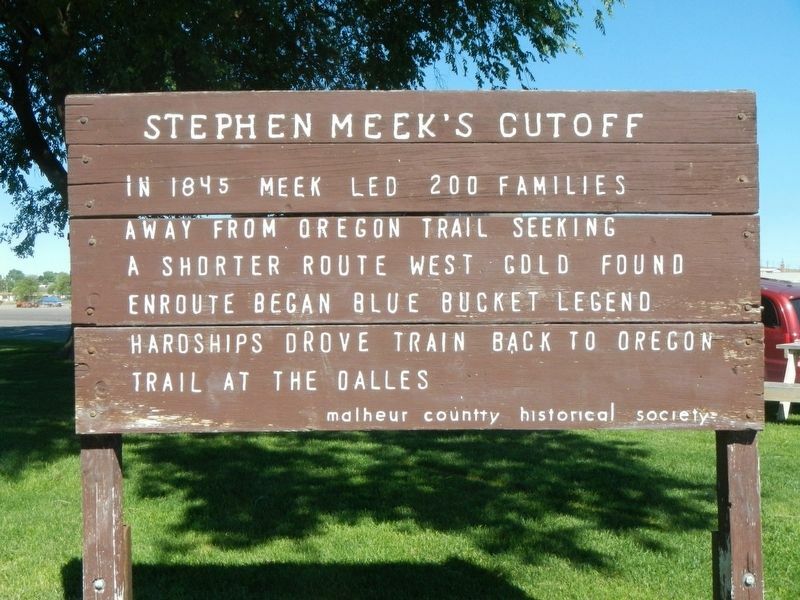 In 1845 Meek led 200 families away from Oregon Trail seeking a shorter route west. Gold found enroute began Blue Bucket legend. Hardships drove train back to Oregon Trail at The Dalles. 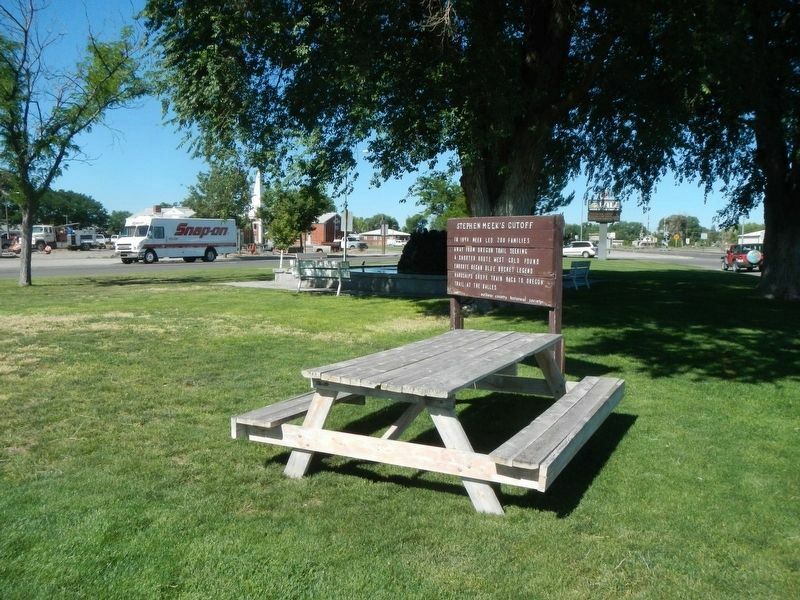 Erected by Malheur County Historical Society. Location. 43° 58.932′ N, 117° 14.964′ W. Marker is in Vale, Oregon, in Malheur County. Marker is on A Street West near Clark Street North, on the right when traveling west. Touch for map. Marker is at or near this postal address: 950 A Street West, Vale OR 97918, United States of America. Touch for directions. Other nearby markers. At least 8 other markers are within 7 miles of this marker, measured as the crow flies. Vale (a few steps from this marker); Vale Oregon Trail Kiosk (approx. 0.7 miles away); Cutoff Fever (approx. 0.8 miles away); John D. Henderson (approx. one mile away); Under the Wagon Cover (approx. 6.2 miles away); First People of the Land (approx. 6.2 miles away); In Search of a Dream (approx. 6.2 miles away); Imagine a Day's Journey (approx. 6.2 miles away). Touch for a list and map of all markers in Vale. More about this marker. This markers is located in Lewin City Park, a triangular park bound by A Street West, Clark Street Noth, and Washington Street West. More. Search the internet for Stephen Meek's Cutoff. Credits. This page was last revised on August 15, 2017. This page originally submitted on August 15, 2017, by Barry Swackhamer of San Jose, California. This page has been viewed 91 times since then and 6 times this year. Photos: 1, 2. submitted on August 15, 2017, by Barry Swackhamer of San Jose, California.